Cracked, MAD and Crazy all started (and often ended) their issues with a send-up of a movie or TV show. 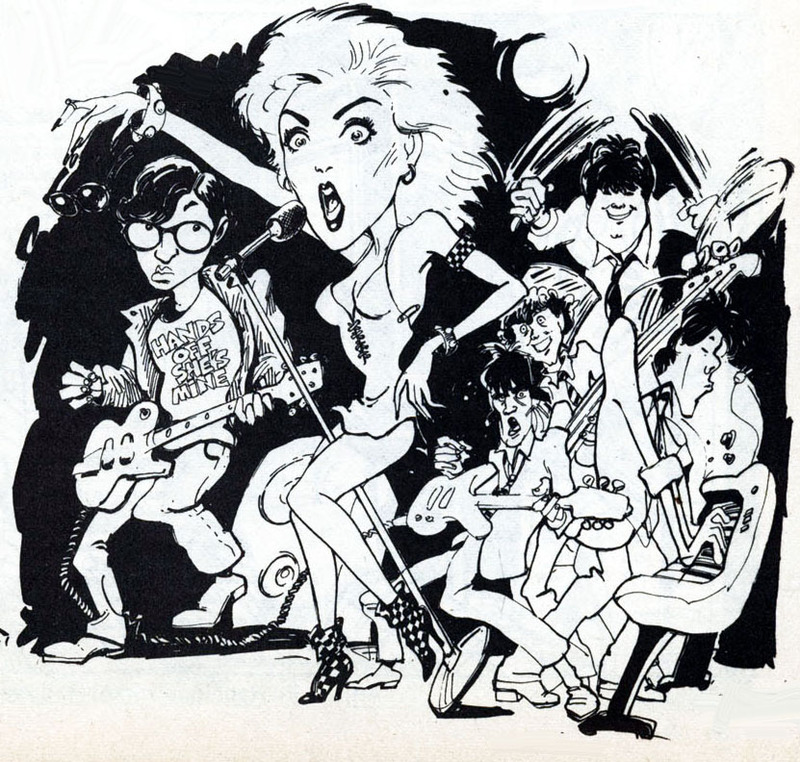 This, of course, would require the skills of an artist who could capture the likeness of actors and actresses. Today, let's have a look at some of the works of Crazy spoof artists - we'll cover the other magazines later. It goes without saying that the MAD's Mort Drucker is the king of them all, with 194 film spoofs to his credit. 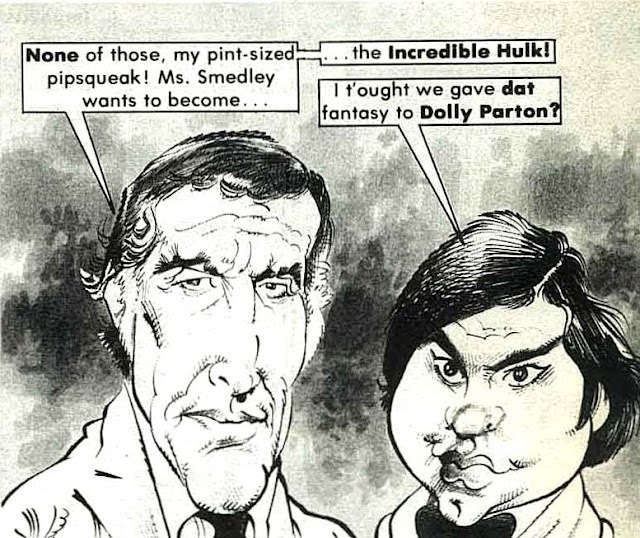 But us 70's kids weren't so discerning, and were perfectly happy with Crazy's offerings and Mort Drucker substitutes (primarily Kent Gamble). But this post isn't a scholarly article on the artists and their rich tapestry of caricatures. Instead, I just like looking at their works, conjuring up images of TV/movie yesterdays. Enjoy. Gamble is a master - so I won't knock him. 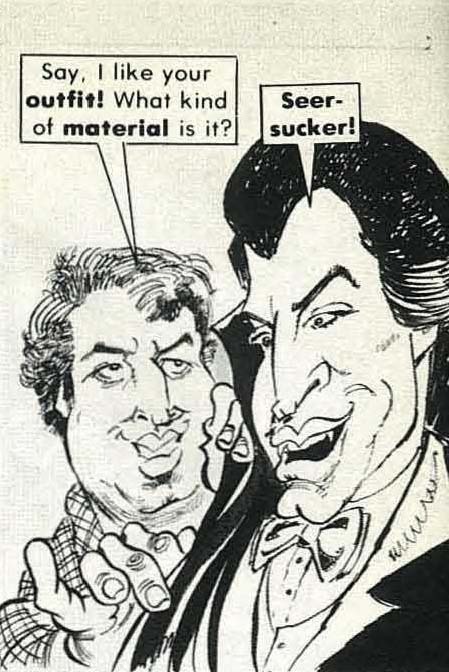 However, I will say he seems very derivative of Mort Drucker. 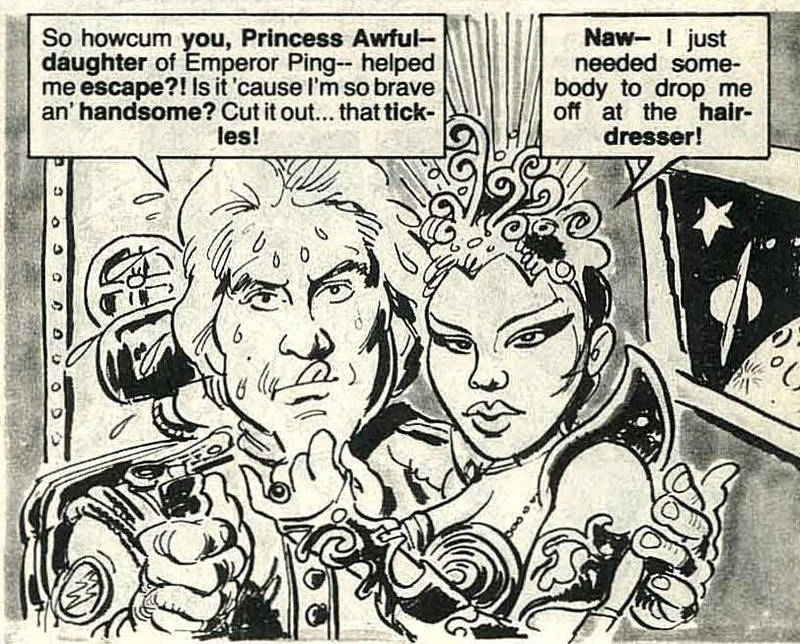 And if I had a complaint it's that most of Gamble's panels are throw-aways, with only a few here and there that really demonstrate likenesses. 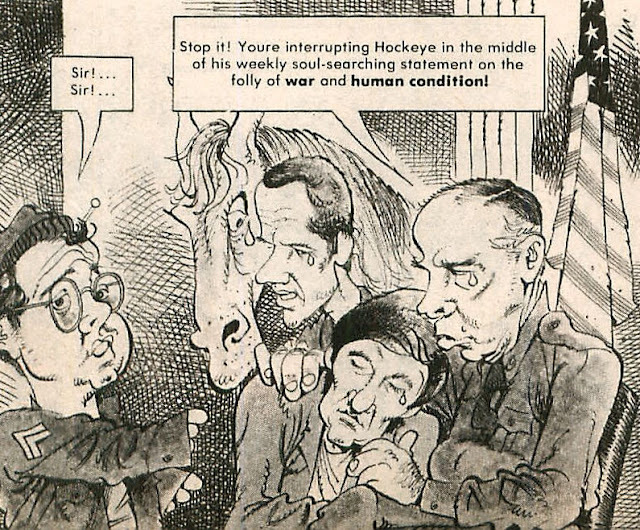 For Drucker, every panel is suitable for framing, so perhaps it's an unfair comparison. Damn the jokes were cheesy. This goes for all the humor magazine TV-Movie parodies. It's one lame pun after another. But guess what? In the 70's, we lapped it up and begged for more. Most of Dave Morris' stuff is highly stylized, with a very rough unfinished look. This is one of his better caricatures. More often than not, Morris' work just looks sloppy. There will be a post coming your way soon which addresses the sexual innuendo and "inappropriateness" of these humor mags gobbled up by the kiddies. Stay tuned. Recognize the name? Bob Camp would go on to create Ren & Stimpy. I mentioned that these parodies could be cheesy - but they also could be rather biting. They really didn't pull any punches - sometimes being downright mean (which, admittedly, I love). 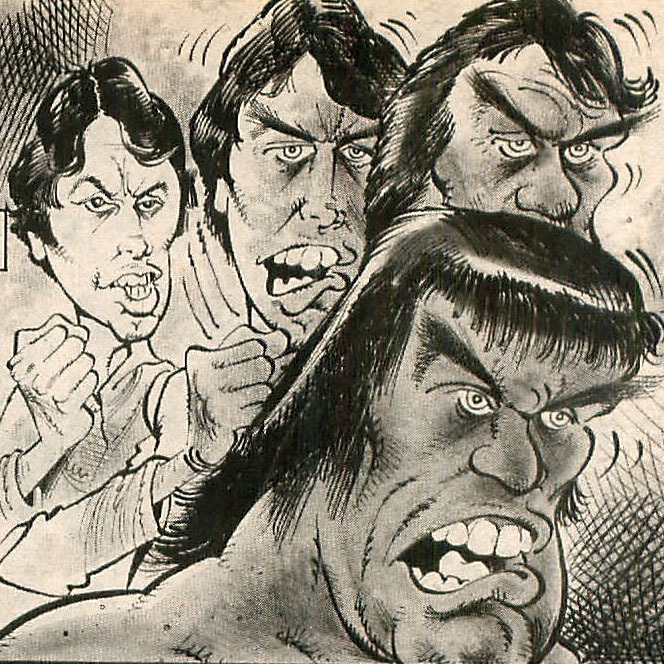 One person I didn't include in this post is Marie Severin, who did numerous parodies. Any comic book geek worth his or her salt knows her name as she was part of the EC all-star lineup before moving on to Marvel. 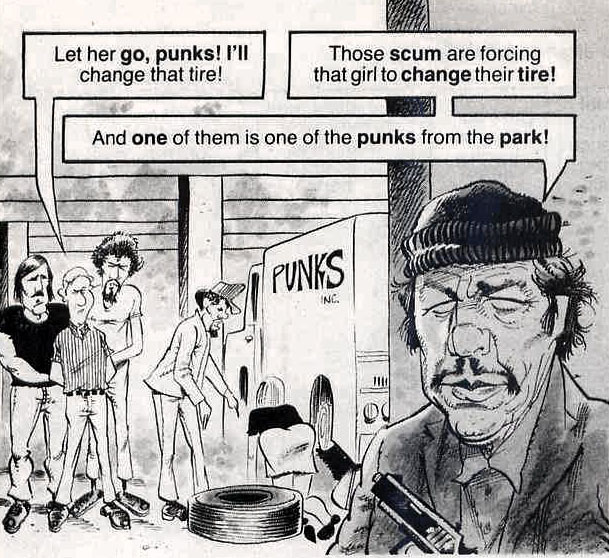 Her brother, John Severin, is my second favorite spoof artist (next to Drucker, of course) who did a lot of work for Cracked. Rodewalt worked for Marvel for about 5 years and then became the political cartoonist for The Calgary Herald where his a much respected fixture to this day. 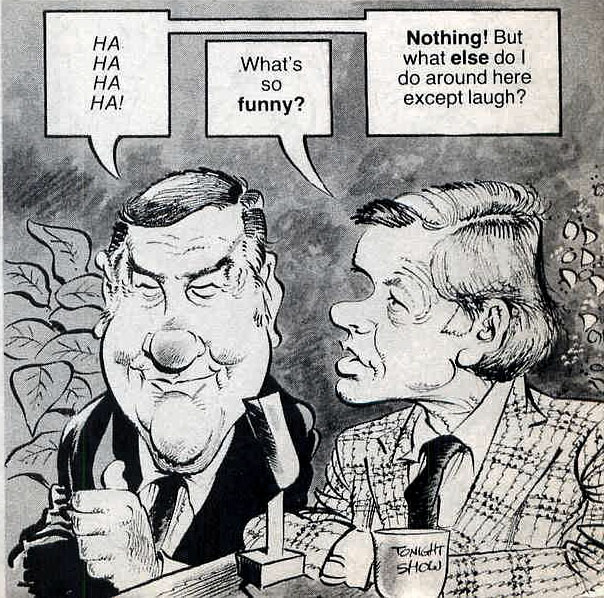 In 1988, he tried his hand at a comic strip called Chubb and Chauncey which lasted about ten years (probably nine years longer than it should have). Why no Mort? Nobody could hold a candle to his work. 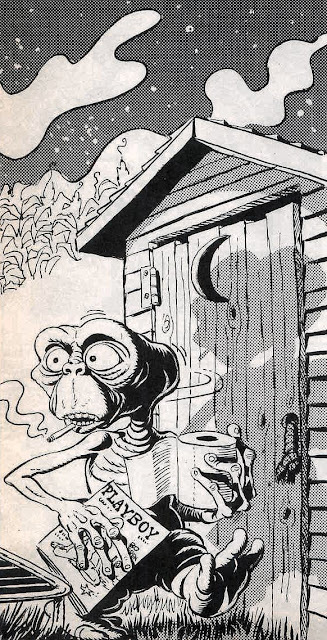 Don't be Mort-ified, according to Pete's introduction to his post Mad Magazine's crazy spoof art gets covered at a later date. I'm sure at that time their will be plenty of Mort and his co-horts to satisfy your needs. Bob Camp did work on Ren & Stimpy, as well as a variety of other cartoons, but he didn't create Ren & Stimpy, that series was created by John Kricfalusi. Mort is the king but it's cool of you to show these other guys toiling in his shadow. 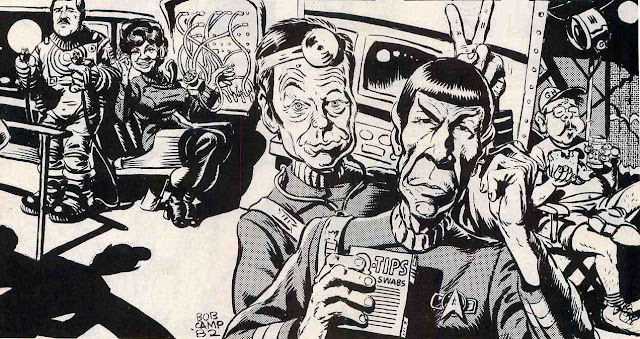 Drucker did a lot of ads, as did Jack Davis and The Usual Gang of Artists. It would be nice to see some of it posted here [HINT]. I'd forgotten about Chubb and Chauncey. Uh...I have nothing else to say. "Less discerning in the 70s?" I'd say kids were MORE discerning then! Why I can't stomach today's comics and much of the "lowest common denominator" product. We were SO spoiled by an endless array of true craftsmen then..Sure, there'd be some clunkers along the way, but..
Bob Camp did not create REN & STIMPY. He was one of four who formed the animation firm with leader John Kricfalusi, who formed the show..
>and "inappropriateness" of these humor mags gobbled up by the kiddies. Looking forward to that one. 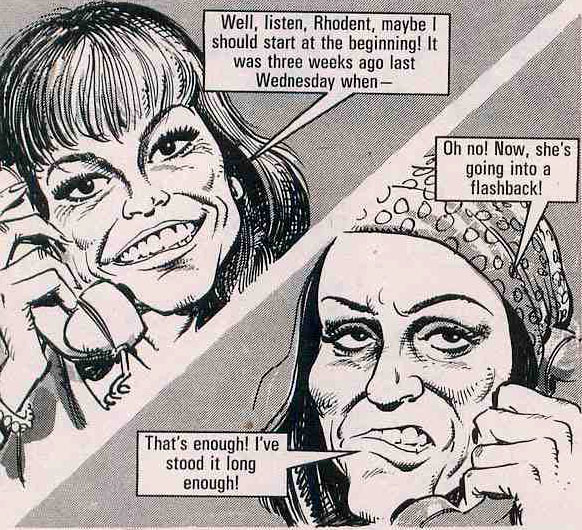 You'll certainly cover Bill Ward's Nanny Dickering of Cracked magazine. How did they get away with that? And how did I get away with buying the magazine? My mom must never have looked through it. 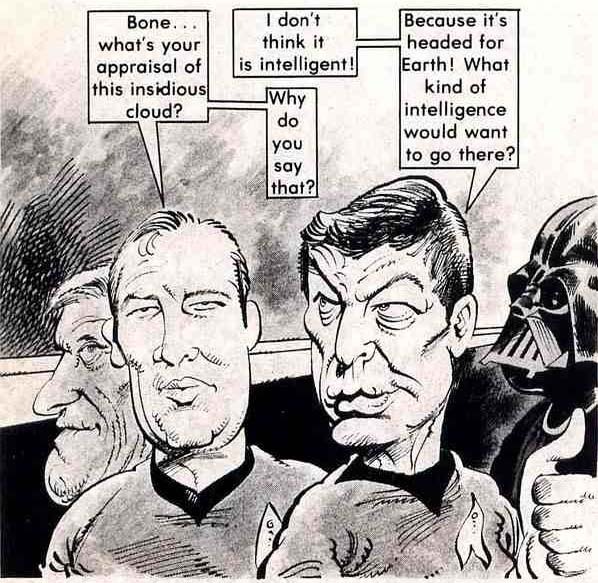 John Severin was the king of the TV and movie parodies, in my opinion, better than Mort Drucker. Also, the sexual innuendo in the mags gave them spice, nothing wrong with it at all. I also agree with the one person who commented stating that modern comics are mostly garbage.